Founder and owner Becky Eberly launched the company in 2000 to offer a full suite of services to meet the varying needs of local pet owners. That includes midday dog walking, vacation pet sitting, overnight pet sitting, private boarding, doggie daycare, hotel/hourly pet sitting, pet transportation, pet supply shopping, pooper-scooper services and even wedding pet care. So, what goes into your typical pet sitting appointment? According to Becky, visits meet all the pets’ needs and more. Dog Days & Cat Naps usually provides one to two visits per day for cats and other small animals, as well as two or three visits per day for dogs. Interested in pet services but have a bashful pet? Becky recommends scheduling a meet-and-greet with the pet sitter before any pet sitting begins. Rest assured your furry friend is in expert hands. 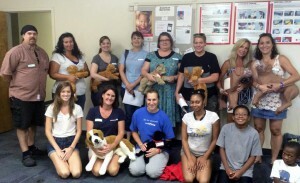 The company’s sitters, who are spread throughout Duval, Clay and St. Johns counties, are life-long pet owners and most are trained in pet first-aid. Visit www.dogdayscatnaps.com to meet the sitters as well as check out rates (10% off for military and seniors!) and even create an account to request services, view your schedule, cancel visits, upload pet info and photos and pay online. Also, connect with Dog Days & Cat Naps on Facebook to receive promotions and coupons through its online newsletter (www.Facebook.com/dogdayscatnaps). Want more information? Call 904-241-7387 or email dogdays1@comcast.net. Don’t paws and wait – call meow!